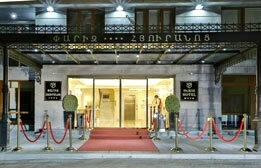 With a convenient city center location near Charles Aznavour Square, on Abovyan Street, The Alexander, a Luxury Collection Hotel by Starwood is created to offer unique experience and individual approach to its guests through the delivering unbeatable service and exceptional accommodations. The Republic Square and National Art Gallery are just steps away from the hotel. 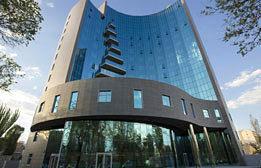 The Radisson BLU Hotel Yerevan offers high class accommodation to all types of travelers for any length of stay. The spacious rooms at Radisson BLU Hotel Yerevan feature bright décor, high quality furnishings, and cosy carpet. Located within a 10 minute walk from the Victory Park, this 5 star hotel’s hilltop setting overlooks Yerevan, with the Mount Ararat rising majestically in the distance. The Yerevan city center is just a 5 minute ride away. Featuring a grand facade, the Grand Hotel Yerevan is a stately, Neoclassical hotel, located within 5 minutes’ walk from the National Gallery, the bustling Republic Square, the nearest Metro station and the landmark Yerevan Opera House. The historical and rich cultural heritage gives a special flare to this hotel, which is the first hotel of Yerevan built in 1926. 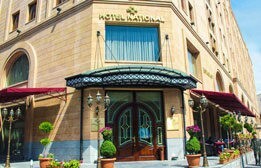 Hotel National is set in Yerevan’s city center, within a few minute’s walk from the landmark Republic Square, the National Gallery, Northern Avenue and Abovian Street. Hotel National features high, cornice ceilings, large windows with luxurious drapes, fireplaces and colorful tiling work. The spacious rooms, studios and suites are decorated in attractive neutral tones. Armenia Marriott Hotel Yerevan is keeping the best traditions of Marriott International, and welcomes the most demanding visitors with a broad range of services and entertainment opportunities. Being situated in the heart of the capital of Armenia, on the Republic Square, the hotel is within quick access to most of sightseeing places, theatres and concert halls. The DoubleTree by Hilton Yerevan Hotel is situated on the Grigor Lusavorich Street, within only 10 minutes walk from the Republic Square. For the guests who know the value of comfort and chic, the DoubleTree by Hilton provides caring services, as well as spacious, stylish and comfortable standard, deluxe and family rooms with panoramic views of Mount Ararat. 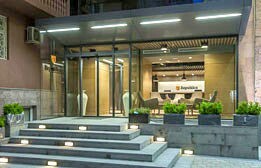 The Hyatt Place Yerevan Hotel is set in the heart of Yerevan, only a minute walk from Republic Square, in close proximity to many of the area’s most popular sights and attractions. The hotel features a selected range of services aimed at providing casual hospitality in a well-designed, high-tech and contemporary environment both for business and leisure guests. 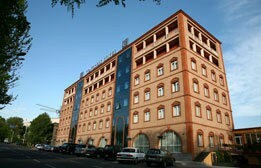 Tufenkian Historic Yerevan is a boutique hotel, combining historic and contemporary features. Designed in 19th century Caucasian style, each room at the hotel features designer fittings and handcrafted Armenian furnishings. 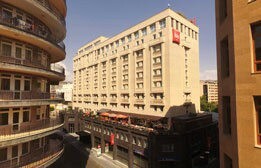 The hotel is situated in a few minutes’ walk from the Vernissage market, Republic Square and the National Gallery. The Ani Plaza Hotel is located in the center of Yerevan, just a block from the Opera House and at a walking distance from Republic Square, National Gallery and Cascade Complex. The spacious rooms at Ani Plaza Hotel feature warm colors and cozy carpet. Some rooms offer panoramic views of Yerevan and Mount Ararat. The Best Western Congress Hotel uniquely combines business and cozy atmosphere. Located in Yerevan’s city center, less than 5 minute walk from the Republic Square and the National Gallery, this elegant hotel features a contemporary design, down from its business style lobby to its impressive Italian terrace with an open air swimming pool. 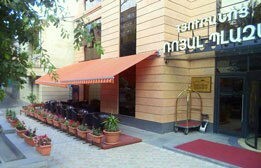 The Opera Suite Hotel is situated in the center of Yerevan, on the Marshal Baghramyan Avenue. The hotel is a collection of 106 chic guest suites, all furnished with comfortable, modern Italian fashion furniture. The Aram Khachaturian House Museum is across the street, and the landmark Cascade Complex and the State Opera House are within a few minutes’ walk from the hotel. Republica Hotel Yerevan is a boutique hotel in the center of Yerevan, located just within a few minutes walk from the Republic Square and National Gallery. 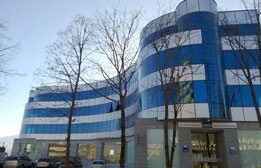 Hotel Republica is designed to provide a truly unique and memorable visit to Armenia by creating a warm and friendly environment for its guests, and providing high quality services at a reasonable cost. 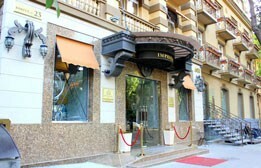 The Paris Hotel Yerevan is located in downtown Yerevan, on Amiryan Street, just a few minutes walk away from the Republic Square and National Gallery. The hotel offers comfortable rooms that have a contemporary design and equipped with all modern amenities. The convenient location of the hotel gives the opportunity to reach all the city attractions and the business centers. The Royal Plaza Hotel is situated in the center of the Yerevan, adjacent to the Martiros Saryan Museum and the Hovhannes Tumanyan Museum. The hotel features a mixture of classical and modern styles, and furnished with all necessary amenities. A number of trendy cafés, pubs and wine shops can be found within a few minutes’ walk from the hotel. The Imperial Palace Hotel is located within a few minutes’ walk from the Matenadaran Institute of Ancient Manuscripts in Yerevan. A 8 minute walk from the State Opera House and the landmark Cascade Complex, this upscale hotel offers modern and comfortably furnished rooms of different categories, featuring views of Mother Armenia monument and Mount Ararat. The Central Hotel is located in the heart of Yerevan city center, within 5 minutes’ walk from the Republic Square and National Gallery. The hotel offers comfortable rooms that have a contemporary design and equipped with all modern amenities. The convenient location of the hotel gives the opportunity to reach all the city attractions and the business centers. Ideally close to major business centers, embassies, ministries and the Central Bank, the Holiday Inn Express Yerevan hotel is the ideal place to rest and recharge in the Yerevan city center. Only 15 minutes by car from Zvartnots International Airport and 3 minutes’ walk from the Republic Square, Holiday Inn Express Yerevan is near to famous attractions like the Opera House, the National Gallery and the Vernissage Market. 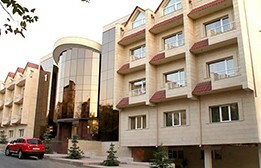 Nairi Hotel is located in the Nork Marash district, in one of the most picturesque and quiet areas of Yerevan. The hotel offers stylish, comfortably furnished and fully equipped rooms, featuring a panoramic view of Yerevan city. 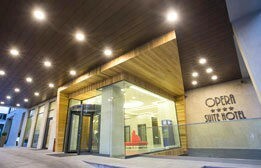 The hotel is only a 10 minute drive from the city center, and 35 minutes from the Zvartnots International Airport. Located in the Nor Nork district of Yerevan, the Nork Residence Hotel is designed with high standards to meet all the requirements of the modern hotel. The Yerevan city center is only 10 minutes’ drive away, and Zvartnots International Airport can be reached in 20 minutes’ drive. A bus stop is 50 meters from the hotel. Villa Ayghedzor Hotel is located within a 5 minute walk from the Marshal Baghramyan Metro Station and the Yerevan’s popular Lover’s Park. The boutique hotel is a fascinating collection of bright, spacious rooms, styled in the Italian villa manor, with an Armenian twist of locally found antiques, folk crafts and artwork. Ideally situated in the heart of the city, the Ibis Yerevan Center Hotel offers the best location on the main pedestrian shopping street of Yerevan, the Northern Avenue. The hotel is just a short walk away from major Yerevan attractions such as the State Opera House, Abovian Street, Republic Square and National Gallery. The Silachi Hotel is located at a short walking distance from the center of the city, within a 10 minute walk from the Republic Square, National Gallery and St. Gregory the Illuminator Church. The hotel offers bright and comfortable rooms, some feature a spa bath. There are plenty of ATM’s and shops nearby, among which is the popular fruit market “Shouka” located just across the street. 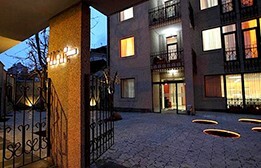 The Cascade Hotel is located only a few meters away from the Cascade Complex and the Cafesjian Art Center in Yerevan. 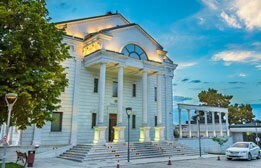 The House Museum of Aram Khachaturian is just around a corner, and the State Opera House is within a 10 minute walk from the hotel. Every room at Cascade Hotel is decorated in a classic style and features all modern conveniences. The Regineh Hotel is situated in one of the cozy nooks of suburban Yerevan, and only a 10 minute drive from the city center. Walking into guest rooms one will discover the ideal blend of comfort and elegance, blended together with maximum functionality. The marble-floored lobby features a grand piano, and most of the rooms have balconies with the breathtaking views of Mount Ararat. Located in Dzoraget, on the banks of the river Debed, this grand hotel is featuring a historic castle facade, a range of spa facilities, and a restaurant with riverside terrace. Tufenkian Avan Dzoraget Hotel’s elegant rooms are decorated with handmade Tufenkian carpets and traditional Armenian furniture. The hotel is just a 15 minute drive from the historic Haghpat and Sanahin monasteries. 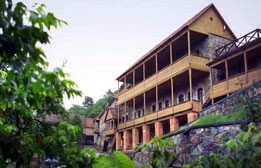 Hotel Qefilyan is located in the village of Haghpat, near the Haghpat Monastery, which is one of the most significant monuments of medieval Armenia. 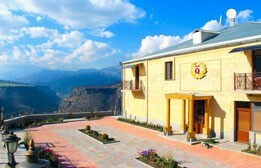 The hotel has an elegant interior and exterior, offering a picturesque panorama of the gorge of river Debed. The Haghpat Monastery is only 200 meters from the property, while Alaverdi Train Station is a 15 minute drive away. 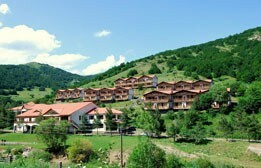 The Apaga Resort is located in the picturesque area of Ijevan, in the Tavush Province of Armenia. The comfortable cottages and cozy houses of the resort combine the traditional style of Armenian houses with all modern amenities. The resort provides an excellent opportunity for relaxation in the mountains, offering horseback riding, ziplining and other active adventures. 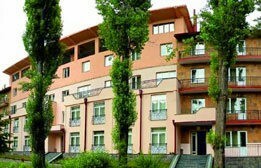 Best Western Paradise Hotel is located in a picturesque area of Dilijan, within a 5 minute drive from the M4 Highway, which connects Armenia and Georgia. The rooms are well furnished, mixing classic and modern interior styles, and fully equipped with all the necessary facilities. Dilijan town center is 7 km away, and the Lake Sevan is only a 20 minute drive from the hotel. Ideally located on one of the hills in the middle of the forest, the Hotel Dilijan Resort, with its panoramic views of the Dilijan National Park, is designed to meet the needs of both business and leisure travelers. The spacious, classic style rooms and suites of the hotel featuring all modern facilities. 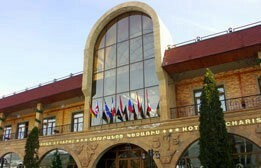 The International College UWC Dilijan is a 5 minute walk from the hotel. With a facade featuring exposed stone and wood, this hotel is located on Sharambeyan Street, in the historic district of Dilijan. All rooms at Tufenkian Old Dilijan Complex Hotel feature the 19th century decor and handmade wooden furniture, antique wardrobes and hand woven carpets. 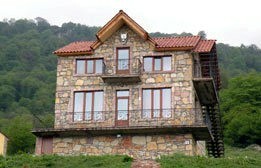 The suites also include a separate seating area and a spacious terrace, overlooking Dilijan. 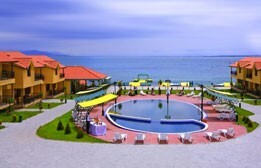 Located on the Lake Sevan shore, this resort hotel is only 40 minutes’ drive from Yerevan. All the rooms and cottages at the Best Western Bohemian Resort Hotel feature a classic style decor, with large windows overlooking the Lake Sevan. The Sevanavank Monastery is only a 4 minute drive from the hotel, and the M4 Highway is just a minute away, providing a direct link to Yerevan. Located on a hilltop and overlooking the scenic Lake Sevan, this large hotel complex features a modern interior, a water park and private beach area. The Harsnaqar Hotel Complex consists of the main building, with different types of rooms, mini cottages and the two-storied cottages. The Sevanavank Monastery is only 3 km from the hotel and the Sevan Train Station is just 5 km away. The Blue Sevan Hotel is located only 8 km away from the Sevan Peninsula. The hotel consists of the main building, cottages and the VIP cottages. Being shielded from the north winds by the mountains and having a magnificent view of the lake, the resort has a fantastic location and scenery. The Zvartnots International Airport is 98.5 km away. 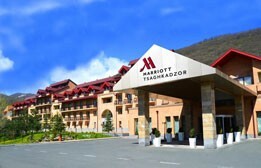 Located in the Armenian ski resort of Tsaghkadzor, the Tsakgkadzor Marriott Hotel brings modern luxury to the beautiful mountains of this resort town. Some rooms look out over the Kecharis Monastery and the 10th century Bjni Fortress is 22 km from Tsaghkadzor Marriott Hotel. Zvartnots International Airport is 69 km away. Best Western Alva Hotel & Spa is located just a short 2 kilometers outside the Tsaghkadzor town’s center, the 2,000m high up on the scenic slope of the Mt. Teghenis. Made up of the complex of cottages and suites, it features its own lighted ski trail. The Tsaghkadzor ski resort is just 50 meters away from the hotel. The Kecharis Hotel is situated in the very heart of the picturesque Tsaghkadzor town, within a few minutes’ walk from the Kecharis Monastery, and within a 5 minute drive to the Mt. Teghenis ropeway. Kecharis Hotel offers its guests complimentary transfer service to the Tsaghkadzor ski lifts on the shuttle bus every 15 minutes throughout the day. Hotel Russia is a “Hyatt” style hotel, which offers classic single and double guest rooms, as well as the ‘Presidential Luxe’ apartments. 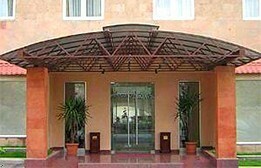 The ground floor of the hotel is furnished with fine furniture and decorated with exotic trees. 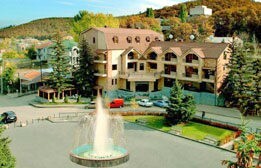 The Russia Hotel has its own shuttle bus, which provides transportation to the Tsaghkadzor ski lifts, as well as throughout the Tsaghkadzor town. 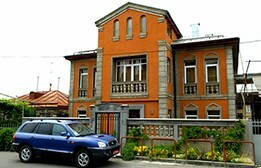 Jupiter Hotel is situated in the heart of Tsaghkadzor, right at the Central Square of the town. It is a modern hotel with all amenities, with rooms ranging from the comfortable economy class to the grand luxe. Jupiter’s free shuttle takes you to the Tsaghkadzor ski lifts, which are only 1.5 km away. A 2 minute walk takes you to the Kecharis Monastery and the Orbeli Brothers Museum. Located in one of the most beautiful alpine corners of Armenia, the Arthurs Aghveran Resort is situated at the base of the Mt. Tsakhkunyats, being only 55 km away from Yerevan. The resort offers an elegant standard twin and double rooms, each feature a balcony with views of the Tsakhkunyats Mountains. Aghveran is one of the most picturesque places in Armenia, located only 55 km north of Yerevan, at the altitude of 1,550m above sea level. 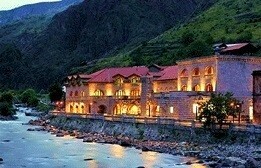 The Best Western Aghveran Hotel is situated on the bank of Dallar River, not far from the Tsakhkunyats Mountains. The hotel consists of the main and several adjacent buildings, offering elegant and comfortable rooms with all modern facilities. 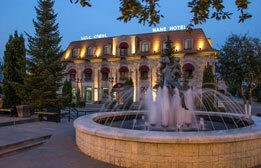 The Nane Hotel is ideally located in the heart of Gyumri’s historic Kumairi district, within walking distance to downtown Gyumri’s numerous museums, art galleries, business centers, ancient churches and other venues of attraction and entertainment. 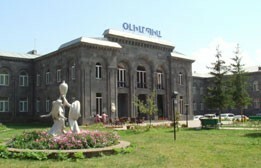 You can drive to Gyumri Central Station in around 7 minutes, and Shirak Airport is a 20 minute drive away. Located in the middle of the Gyumri’s historic district, this Art Nouveau hotel has an appealing blend of old and new world. The Villa Kars Hotel offers pleasant lodging and features a beautiful courtyard along with the original historic structure. 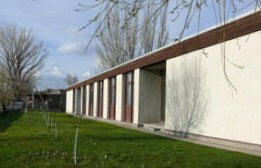 The Gyumri Academy of Arts is 10 minutes’ walk from the hotel, while the Central Park is 12 minutes’ walk away. 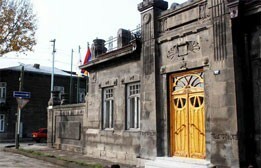 Berlin Art Hotel is located in the very heart of old Gyumri, near the historic market, restaurants, museums and churches. All rooms are equipped with all modern facilities and decorated with the original works of Armenian artists. Other hotel facilities include a garden, a desk and the seating area. The Hyatt Place Jermuk Hotel provides the perfect space and essential services for a blended lifestyle of work and relaxation. 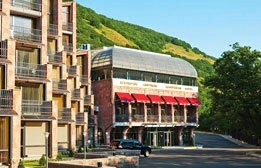 Guests staying at Hyatt Place Jermuk will be able to discover the discreet charm of Jermuk, a mountain resort town known for its thermal water spas. The hotel will also be an ideal base for guests to explore the natural beauty and cultural heritage of the area. 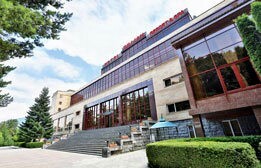 Armenia Wellness & Spa Hotel Jermuk meets all international standards in terms of the traditional features of the resort zone and the latest technologies in medical care. 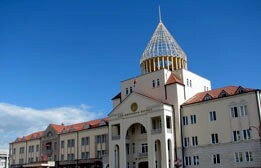 The sanatorium building features a classic Armenian monumental style, offering comfortable rooms with all the amenities. 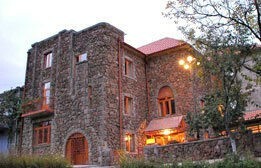 Jermuk is 173 km away from Yerevan, and it is located at 1,980-2,080m above sea level. 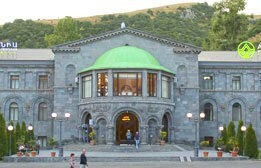 Jermuk Olympia Sanatorium is located in the center of Jermuk town, near the park and the mineral water drinking gallery. The Sanatorium interior is executed in classical style, featuring marble and oak parquet floors, carved pillars and crystal chandeliers. Sanatorium treatment package includes external and internal use of thermal water, nutritional care, climate, physiotherapeutic procedures, fitness and regimen. 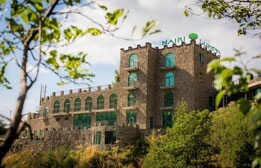 Nairi Hotel is located in the picturesque resort town of Jermuk, at 2,550m above sea level. The hotel offers comfortable and cozy rooms with all modern amenities, with windows and balconies overlooking the surrounding mountains. The hotel is within a 7 minute walk from the city center, and there are plenty of restaurants and shops nearby. 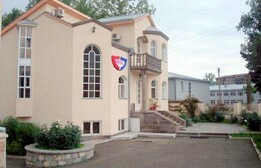 The Hotel Basen is situated in Sisian town, in the Syunik Province of Armenia, nearby the main city square. It is conveniently located, especially for those, who is travelling to Nagorno-Karabakh Republic. The hotel consists of the 3 two-storey cottages, featuring a single, double, triple as well as the luxe rooms, that are equipped with all the necessary amenities. 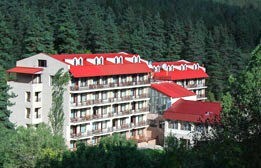 Mirhav Hotel is situated in Southern Armenia, in the Goris city of the Syunik Province, about 250 km away from Yerevan. The hotel welcomes its guests, offering comfortable, cozy rooms and a warm, friendly atmosphere. The garden of the hotel is just next to the Vararak River, where one can relax and have a lunch or dinner. 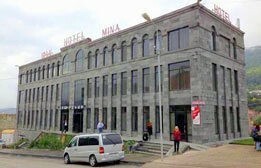 Mina Hotel is located in the northern part of the Goris city, about 250 km away from Yerevan in the Syunik Province of Armenia. The hotel offers affordable prices and the elegant rooms, equipped with all modern amenities. Nearby is the popular Tibetan Bridge in the Khndzoresk village, which is surrounded by the spectacular mountains. 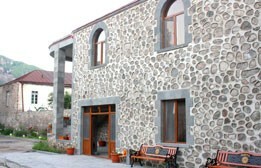 Christy Hotel is located in the center of Goris, renowned for its old buildings and the medieval cave dwellings. With its cordial atmosphere and the gentle elegance, this hotel offers a range of modern conveniences. 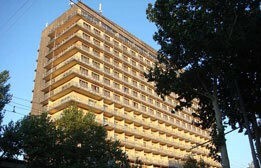 The hotel is very close to the historical and cultural monuments, and the city’s Central Fountain. The Vallex Garden Hotel is a luxury hotel, conveniently located in the city center of Stepanakert, the capital of the Nagorno-Karabakh Republic. The hotel offers elegantly decorated rooms of various categories, featuring comfortable, stylish design and providing an ideal accommodation for business and leisure traveler. The Armenia Hotel is located in the Republic Square next to the Parliament building in Stepanakert, the capital of Nagorno-Karabakh Republic. The hotel offers spacious guest rooms and suites, equipped with all modern amenities. In the summertime guests can enjoy an open-air café next to the entrance of the hotel, overlooking the Stepanakert Republic Square. The Europe Hotel is situated on the premises of the Business Center in Stepanakert, the capital of Nagorno-Karabakh Republic. The hotel offers its guests modern rooms, featuring all necessary facilities, with a sky lounge bar on the roof of the hotel, overlooking the city of Stepanakert. Park Hotel Artsakh is located in the capital city of Stepanakert, in Nagorno-Karabakh Republic. Built in the middle of the 19th century and completely renovated in 2011, the hotel is equipped with all modern amenities. Most of the single and double rooms have balconies, overlooking the church or the Ashot Ghulyan park. 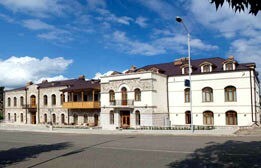 The Heghnar Hotel is situated close to the center of Stepanakert, the capital of Nagorno-Karabakh Republic. The Heghnar complex consists of 3 buildings, offering exquisitely designed, light and comfortable rooms with all modern conveniences. The hotel has also a courtyard, where the guests can enjoy their meals if the weather permits. The Shushi Grand Hotel is situated in the heart of the Shushi town, in the neighborhood of the splendid St. Ghazanchetsots Cathedral. The hotel offers comfortable, well furnished rooms, equipped with all modern conveniences. Most of the rooms have balconies overlooking the Shushi Historic Village.